Childs Engineering personnel mobilized down to the Gulf Coast to conduct both underwater and topside tower inspections for the USCG. 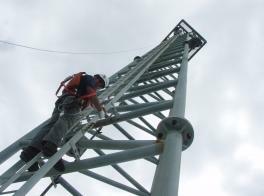 Some of the towers were several miles offshore so we sent down our in-house engineers that are certified to both climb tower structures and also certified as ADCI commercial divers. This enabled us to inspect the structures above and below water as efficiently as possible saving the client both time and money.